There have been some interesting developments in the insurance market this week. Today, it was announced that Richard Brindle would retire from Lancashire at the end of the month. The news is not altogether unexpected as Brindle was never a CEO with his ego caught up in the business. His take it or leave it approach to underwriting and disciplined capital management are engrained in Lancashire’s DNA and given the less important role of personalities in the market today, I don’t see the sell-off of 5% today as justified. LRE is now back at Q3 2011 levels and is 25% off its peak approximately a year ago. As per a previous post, the smaller players in the specialty business face considerable challenges in this market although LRE should be better placed than most. A recent report from Willis on the energy market illustrates how over-capacity is spreading across specialist lines. 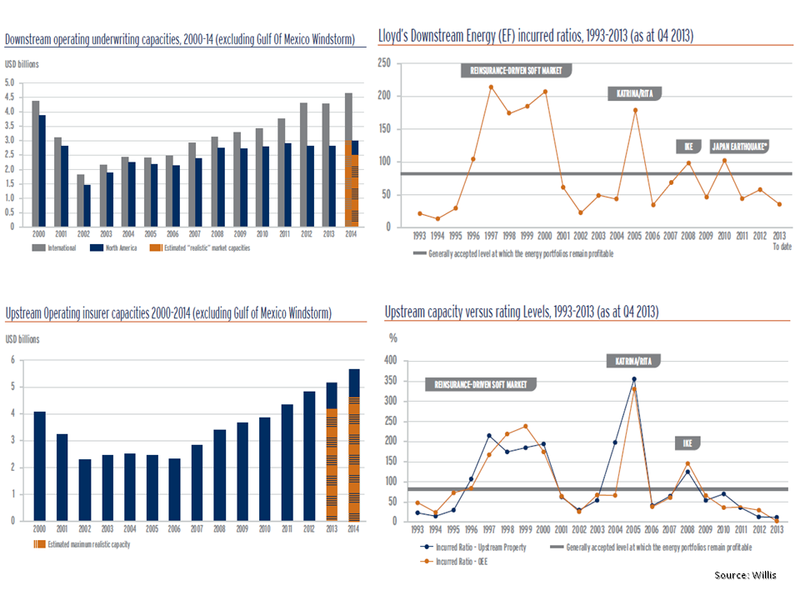 Some graphs from the report are reproduced below. One market character who hasn’t previously had an ego check issue is John Charman and this week he revealed a hostile take-over of Aspen at a 116% of book value by his new firm Endurance Specialty. The bid was quickly rejected by Aspen with some disparaging comments about Endurance and Charman. Aspen’s management undoubtedly does not relish the prospect of having Charman as a boss. Consolidation is needed amongst the tier 2 (mainly Bermudian) players to counter over-capacity and compete in a market that is clustering around tier 1 global full service players. Although each of the tier 2 players has a different focus, there is considerable overlap in business lines like reinsurance so M&A will not be a case of one and one equalling two. To be fair to Charman the price looks reasonable at a 15% premium to Aspen’s high, particularly given the current market. It will be fascinating to see if any other bidders emerge. After going ex-dividend, Swiss Re also took a dive of 9% this week and it too is at levels last seen a year ago. The dive was unusually deep due to the CHF7 dividend (CHF3.85 regular and CHF4.15 special). Swiss Re’s increasingly shareholder friendly policy makes it potentially attractive at its current 112% of book value. It is however not immune from the current market pricing pressures. After doing some work recently on the impact of reducing premium rates, I built a very simple model of a portfolio of 10,000 homogeneous risks with a loss probability of 1%. Assuming perfect burning cost rating (i.e. base rate set at actual portfolio mean), the model varied the risk margin charged. I ran the portfolio through 10,000 simulations to get the resulting distributions. As the graph below shows, a decreasing risk margin not only shifts the distribution but also changes the shape of the distribution. This illustrates that as premium rates decline the volatility of the portfolio also increases as there is less of a buffer to counter variability. 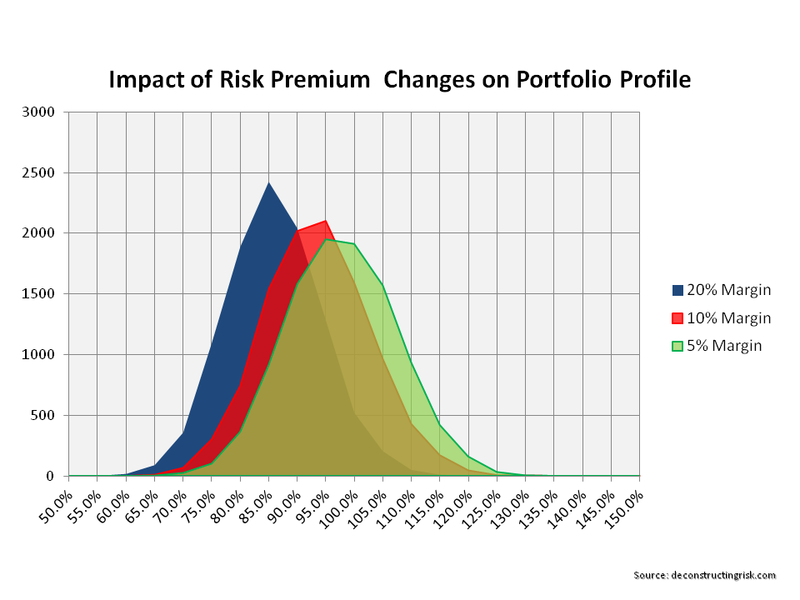 In essence, as the market continues to soften, even with no change in loss profile, the overall portfolio risk increases. And that is why I remain cautious on buying back into the sector even with the reduced valuations of firms like Lancashire and Swiss Re.